HELLTOWN BEER: Other Shoe? OSU. Heard that a lot this evening from the characters involved in the drama that is going on at Ohio State. 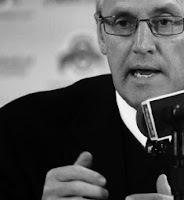 Jim Tressel, coach of the Buckeyes has stepped in it, or did step in it when he found out about players on his team being involved with a tattoo parlor being investigated by the feds. The problem here is that he found out 7 months before anyone else and said nothing. I like Tressel. He is a good man. He has earned a lot of clout over the past decade coaching and that will serve him over the next year. He is right in the middle of a high-holy-shitstorm right now and I wish him the best. I do not think he was covering up for his players just to play them to win. I think he was genuinely trying to protect them. Them being: "young people". Now... the rest of the University? Then NCAA infractions committee will not be as kind. I think it will result in vacated wins, loss of scholarships and no relaxing on the suspensions of the players involved (5 games). Anything the NCAA can smack on the University, they will. "Mark my words... Another shoe has yet to fall and it will be ugly. This school's reputation has taken a major hit. I'm not that old, but old enough to know that when this happens... you are done for years." No. It is not. Imagine the shoe just getting let go. I know it will hit a some point for sure now. I still think the players have a bigger story that will come back to bite them. The feds ain't done with this one yet. If they come back, knocking on Jim's door about why he didn't say anything earlier? not good. My last thought for now on this is on AD Gene Smith. I think his is arrogant and a lot of other nasty things. His hands are all over this. The road will lead to him.